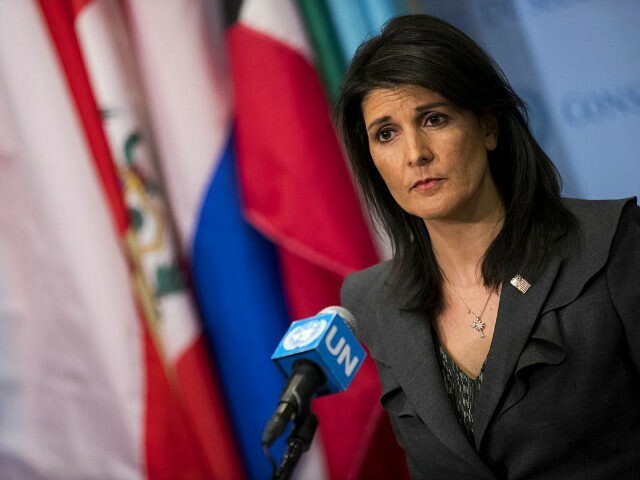 TEGUCIGALPA, Honduras (AFP) — The US ambassador to the United Nations, Nikki Haley, on Tuesday heaped fulsome praise on Honduras for being one of a few countries that backed the controversial US decision to move its embassy to Jerusalem. In a visit to Tegucigalpa to see newly re-elected Honduran President Juan Orlando Hernandez, Haley stressed that US President Donald Trump’s government was “committed” to Hernandez and his administration. The two countries’ bonds were evident, she said, in the way Honduras voted with the United States at the United Nations in December to support Trump’s plan to move the US embassy to Israel from Tel Aviv to Jerusalem. In the end, the UN General Assembly overwhelmingly voted to condemn Trump’s move. A total of 128 of the UN’s 193 member states voted against Trump’s recognition of Jerusalem as Israel’s capital, maintaining the international community’s view that the holy city’s status must be decided through talks between Israelis and Palestinians. Just eight countries voted with the US: Honduras, Guatemala, Israel, the Marshall Islands, Micronesia, Nauru, Palau and Togo. The United States said last week it would relocate its embassy to Jerusalem in May, essentially designating its pre-existing consulate there as its main mission. In Tegucigalpa, Haley emphasized that Washington stood fully behind Hernandez, who won a second mandate after a November election bitterly disputed by the opposition, which called the vote rigged. The European Union and the Organization of American States (OAS) both raised questions over the poll’s fairness. Protests have been ongoing since that election, with demonstrators saying Hernandez was illegitimately named the winner over the opposition candidate, Salvador Nasralla, who is of Palestinian descent. Haley called on all Hondurans to put the election behind them and rally to Hernandez. She said she and Hernandez discussed other issues, notably efforts to stop Central American migrants illegally entering the United States, and the battle against gangs and drug trafficking.